Seeing an orthodontist is just as important as seeing your dentist on a regular basis. Did you know that children need to see the orthodontist and not just teenagers and adults? The American Association of Orthodontics recommends that children have their first orthodontic visit between the ages of 7 and 8. This is a critical time to detect and correct bite and alignment problems before they become severe later on in life. We can help you know what your child can expect from their first orthodontic visit to ease nerves. When a child grows to be a teenager, they will have to see the orthodontist again. This is to align the teeth once the adult teeth have grown in during early adolescence. We can help you know what to expect from a first orthodontic visit and how your treatment will be throughout the months of bite and alignment correction! Just as there are recommendations for seeing the dentist, there are also recommendations for seeing an orthodontist. The majority of people will benefit from having both a dentist and an orthodontist to monitor their oral health. Both specialize in the health of the teeth. However, a dentist deals primarily with your teeth, gums, nerves and jaw, and correct problems such as tooth decay and gum disease. An orthodontist focuses on correcting bite and alignment issues as well as straightening the teeth. The American Association of Orthodontists recommends that children have their first orthodontic visit no later than age 7. This is a critical time in development for children and a time when orthodontic problems begin to manifest. Those problems can become severe later on in life if not found early on. Having an examination early helps to prevent the progression of orthodontic issues. It also helps correct those issues before the adolescent years, when the main focus is straightening the teeth. Many people only think of teenagers wearing braces, but about 1/4th of people wearing braces are adults and many more are children. Some patients even receive braces twice in their life because they received orthodontic appliances as a child and then later on as either a teenager or an adult. 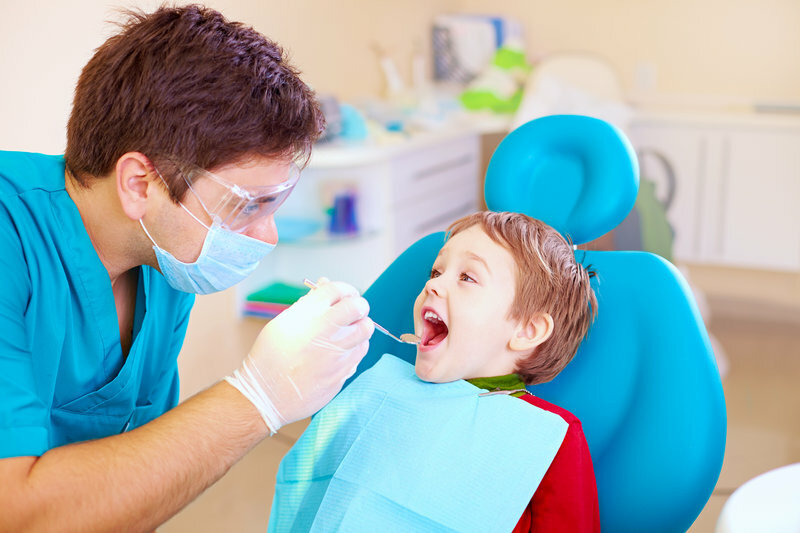 In children, oral health issues are present when they are still young. A child should see the orthodontist between ages 7 and 8. Bite and alignment issues are common in many children at this age. These include problems such as underbite, crossbite, openbite, overbite and more. These problems can severely affect speech development and the ability to eat, chew, bite, speak, etc., as a child ages. Even if you don’t detect any dental issues with your child or they don’t show any signs of orthodontic complications, they should still visit an orthodontist. An orthodontist is trained to observe the proper progress of incoming teeth while monitoring facial and jaw development. They have also been trained in dental school and can spot hidden dental issues. Many dental issues (such as cavities) can actually be caused by crooked teeth or bite and alignment problems that make it hard to brush the teeth properly. An orthodontist can guide incoming permanent teeth into their ideal position and reduce the risk of impacted teeth. Orthodontic appliances also reduce the risk for permanent tooth extractions. Seeing an orthodontist early can greatly impact your life! You can expect to meet a friendly staff when you come into the office. We are trained to work well with children and adults alike. Many of our patients are children and teenagers. We know their concerns, fears, and their expectations. Dr. Hardy and our staff are gentle and comforting with young patients who often have apprehensions about visiting a dental office. Our goal is to practice an open, compassionate dialogue with them so they can feel comfortable and safe. We generally start out the appointment with a tour of our office and an introduction to the staff. You will meet Dr. Hardy and he will explain everything you need to know about your orthodontic care. A first orthodontic visit is a time to examine the teeth and see if braces are needed. Some patients will need them as children, while others will only need braces when they are teenagers. We conduct a thorough examination of your teeth and mouth. We also take photographs and x-rays of your teeth and mouth so that we know the exact size and shape of your jaws and your teeth alignment. If orthodontic treatment is needed, we will also take impression molds of your teeth. This is a simple process where we place soft molding in your mouth, let it toughen up a bit, and remove it for a picture perfect view of your mouth. If treatment is needed, we can make an orthodontic plan for you and explain all that will happen in subsequent visits. As part of our commitment to providing you with the highest quality care, we value your time and want your first orthodontic visit to go as smoothly as possible. We are always available to answer your questions and help prepare you for that first orthodontic visit whether you are a child or an adult. All new patients will receive a comprehensive exam at their first visit to see how their oral health is doing. Then, Dr. Hardy will discuss any orthodontic treatments he believes may be beneficial. To schedule your orthodontic visit or one for your child, call Belmar Orthodontics today at (303) 225-9016!